The neutron star merger that became the gravitational wave source, GW170817, likely birthed a black hole. This result comes from analysis of X-ray data from Chandra in the weeks and months after the initial detection of gravitational waves. If confirmed, GW170817 would contain the lowest-mass black hole known. 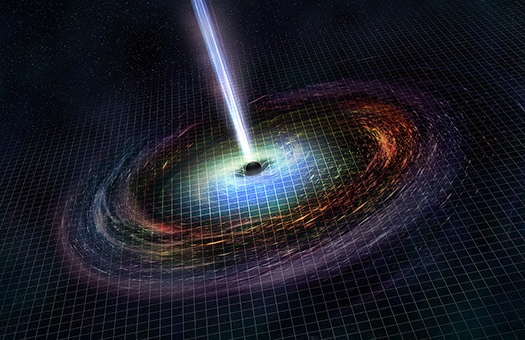 The Chandra data were critical in determining if the neutron star merger created a heavier neutron star or a black hole. The spectacular merger of two neutron stars that generated gravitational waves announced last fall likely did something else: birthed a black hole. This newly spawned black hole would be the lowest mass black hole ever found, as described in our latest press release. After two separate stars underwent supernova explosions, two ultra-dense cores (that is, neutron stars) were left behind. These two neutron stars were so close that gravitational wave radiation pulled them together until they merged and collapsed into a black hole. 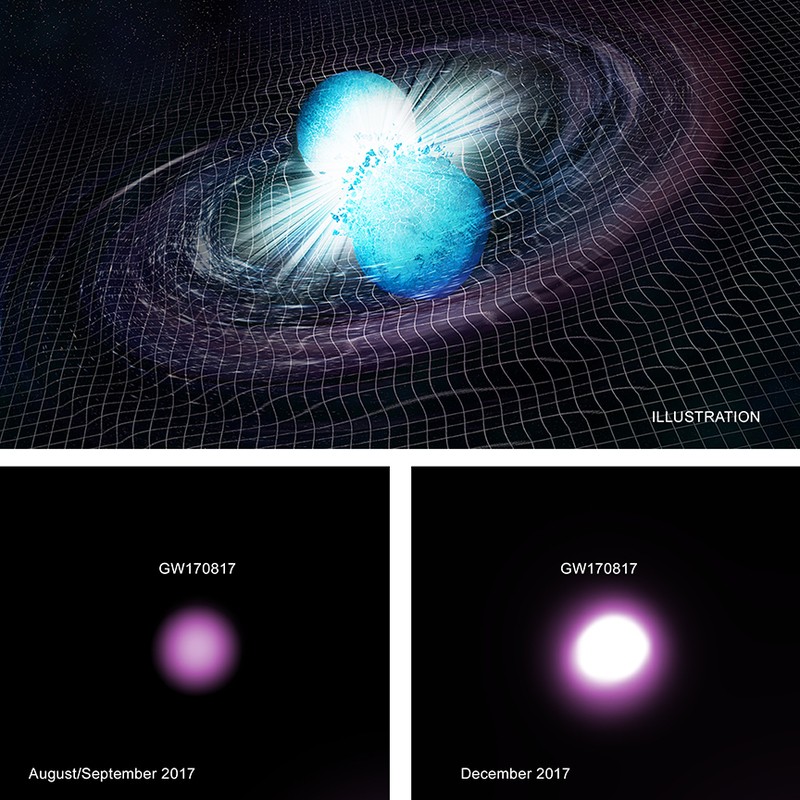 The artist's illustration shows a key part of the process that created this new black hole, as the two neutron stars spin around each other while merging. The purple material depicts debris from the merger. An additional illustration shows the black hole that resulted from the merger, along with a disk of infalling matter and a jet of high-energy particles. A new study analyzed data from NASA's Chandra X-ray Observatory taken in the days, weeks, and months after the detection of gravitational waves by the Laser Interferometer Gravitational Wave Observatory (LIGO) and gamma rays by NASA's Fermi mission on August 17, 2017. X-rays from Chandra are critical for understanding what happened after the two neutron stars collided. The question is: did the merged neutron star form a larger, heavier neutron star or a black hole? Chandra observed GW170817 multiple times. An observation two to three days after the event failed to detect a source, but subsequent observations 9, 15 and 16 days after the event, resulted in detections (bottom left). The source went behind the Sun soon after, but further brightening was seen in Chandra observations about 110 days after the event (bottom right), followed by comparable X-ray intensity after about 160 days. If the neutron stars merged and formed a heavier neutron star, then astronomers would expect it to spin rapidly and generate a very strong magnetic field. This, in turn, would have created an expanding bubble of high-energy particles that would result in bright X-ray emission. Instead, the Chandra data show levels of X-rays that are a factor of a few to several hundred times lower than expected for a rapidly spinning, merged neutron star and the associated bubble of high-energy particles, implying a black hole likely formed instead. By comparing the Chandra observations with those by the NSF's Karl G. Jansky Very Large Array (VLA), researchers explain the observed X-ray emission as being due entirely to the shock wave — akin to a sonic boom from a supersonic plane — from the merger smashing into surrounding gas. There is no sign of X-rays resulting from a neutron star. Thus, the researchers in this study claim this is a strong case for the merger of two neutron stars merging to then produce bursts of radiation and form a black hole. A paper describing this result appears in the latest issue of The Astrophysical Journal Letters and is available online. The authors of this paper are David Pooley (Trinity University, San Antonio, Texas), Pawan Kumar (University of Texas at Austin), J. Craig Wheeler (University of Texas) and Bruce Grossan (University of California, Berkeley). NASA's Marshall Space Flight Center in Huntsville, Alabama, manages the Chandra program for NASA's Science Mission Directorate in Washington. The Smithsonian Astrophysical Observatory in Cambridge, Massachusetts, controls Chandra's science and flight operations. A merger of two neutron stars that likely created a black hole. About 205,000 light years across.